Early in 2017 we were approached by location manager, Carn Burton, as a location for the adaptation of this wonderful book written by Mary Anne Schaffer and Annie Barrows. 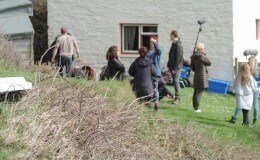 Filming started on the Hartland Abbey Estate, Clovelly and Bideford in early May. Again the Abbey was chosen to have the Unit base on the lawns which is always fascinating for our Abbey visitors who enjoy spotting the film stars! Hartland Abbey estate locations were the beautiful coastline between Hartland Quay and St. Catherine’s Tor and in the nearer vicinity of Hartland Abbey and Blackpool Mill. Night filming under the road bridge was very realistic when a Gestapo patrol with searchlights suddenly appeared making onlookers realise how frightening it must have been at the time. Directed by Mike Newell, the film stars Lily James, Matthew Goode, Michiel Huisman, Jessica Brown-Finlay, Katherine Parkinson, Glen Powell, Tom Courtenay and Penelope Wilton. London, 1946. Juliet, a charismatic and free-spirited writer receives a letter from a member of a mysterious literary club, started in Nazi-occupied Guernsey. Her curiosity piqued, Juliet decides to visit the island. There she meets the delightfully eccentric members of the Guernsey Literary and Potato Peel Pie Society, including Dawsey, the rugged and intriguing farmer who wrote her the letter. As the secrets from their wartime past unfold, Juliet’s growing attachment to the island, the book club, and her affection for Dawsey will change the course of her life forever. In early February 2015 we were approached by Location Manager, Steve Hart, on behalf of the BBC and The Ink Factory, who was looking for a suitable location for the windswept and remote Cornish cottage, the Lanyon. Later in the month a large contingent from Production came down, including Producer Rob Bullock, and the set designers. Always a tense moment when arriving tired after the long journey from London, first impressions are so important and we hoped for a beautiful day to show the cottage in the best light! It was not to be but thankfully they were bowled over by the location having searched much of the coast of Britain. From 11th – 18th April the car park at Hartland Abbey was used as the Unit Base whilst filming went on in Hartland village and at Blackpool Mill Cottage. Getting the larger winnibagos in was a bit tight but we have done it before and it was all fine. A huge amount of support vehicles filled the whole car parking area; make up, costume, catering, cameras, lighting, props to name but a few, with winnibagos for production and the actors. The caterers did an amazing job with delicious food on offer for the big crew. 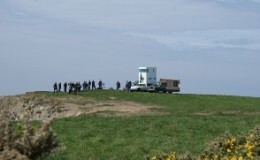 The BBC, the actors and production could not have been more considerate, especially to the Hartland Abbey visitors who managed to get a peek of the filming. Starring Hugh Laurie as Richard Onslow Roper, Tom Hiddleston as Jonathan Pine and Olivia Colman as Angela Burr, at the time of writing it has got off to a fantastic start; we are eagerly awaiting the Hartland and Blackpool Mill scenes in Episode 2. It has been an honour for us all in Hartland to have been awarded such a prestigious production but it is thanks to the welcome and help of local people in the past and an abundance of accommodation locally at Hartland Quay, Clovelly and elsewhere that has made Hartland such a popular place to film. During May 2007 the BBC spent three weeks here for the filming of Jane Austen’s classic, ‘Sense and Sensibility’, adapted by Andrew Davies. Janet McTeer, Mark Williams and a star studded cast braved the rain and gales which May so cruelly provided for them! Our car park was the unit base with all the usual paraphernalia associated with filming – huge lorries for make up, catering and costume, actors’ Winnebagos, horses, carriages etc; it was very exciting! The donkeys had a particularly good time; the smart horses used in the film arrived with some very special hay most of which was stolen by the very greedy donkeys! 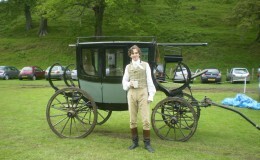 Our visitors were amazed to see actors and actresses wandering about in period costume or coachmen buying ice creams; it was certainly an added attraction. At the end of the week all the huge vehicles cleverly departed without leaving a sea of mud for which we are eternally grateful. Blackpool Mill Cottage was transformed with some beautiful additions and a particularly lovely seaside garden. The BBC screened this in the spring 2008 and it certainly was a wonderful production. Hartland Abbey has been used not only as a location but also as a production base. It contains many different periods of architecture and decoration from mediaeval to Georgian, Regency and Victorian with a strong Gothic influence. There is plenty of hard-standing near to the house for vehicles and the Abbey has 24 telephone lines which can be reconnected at any time including Broadband. Helicopters can land within 100 metres of the Abbey. The Abbey, Hartland Quay, Blackpool Mill and the estate have been used recently by BBC for Sense & Sensibility, BBC Top Gear, Barbour photo shoot, Mario Testino filmed here for American Vogue, German TV for Rosamunde Pilcher’s The Shell Seekers, The Dark ( a supernatural thriller 2004), BBC Hercules (2003), BBC A Natural History of Britain with Alan Titchmarsh (2003). BBC Gardeners World, War Zone, The Shout, Water, An Element of Doubt and Treasure Island have all been filmed here in the past. The Hartland coastline became a very convincing St Lucia in Water with Michael Caine, thanks to some well positioned palm trees! And to think it all started with Walt Disney coming here to film his original Treasure Island. Affeton Castle is also part of the estate and lies approx 10 miles south of Exmoor in totally unspoilt, hilly countryside.The small castle and its thatched, Devon longhouse is situated on top of a hill overlooking the a spectacular river valley. Surrounded by 1,000 acres of traditional farmland with wooded valleys, it is in a very peaceful part of the county with virtually no sights or sounds of modern life. Filming for BBC Top Gear on the Warren.